Heads and Tales [Snake or Reptile Skin Binding]. da Hoffman, Malvina Cornell (American sculptor; 1885-1966). : Charles Scribner's Sons, New York, 1936. Signed presentation copy to the creator of this binding (Helen Wormser) in 1943. Soft cover, 1st Edition, Signed by Author(s) - Peter Keisogloff Rare Books, Inc.
Home Hoffman, Malvina Cornell (American sculptor; 1885-1966). Heads and Tales [Snake or Reptile Skin Binding]. 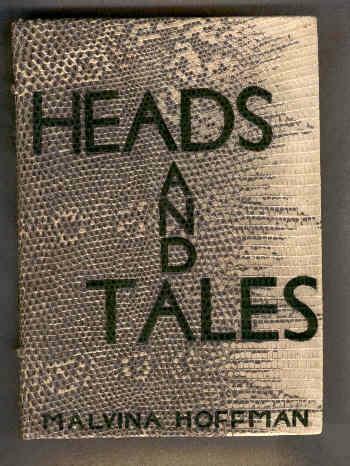 Heads and Tales [Snake or Reptile Skin Binding]. Hoffman, Malvina Cornell (American sculptor; 1885-1966). Casa editrice: Charles Scribner's Sons, New York, 1936. Signed presentation copy to the creator of this binding (Helen Wormser) in 1943. Master Charge or Visa or by check, money orders. Returns Policy: Within 30 days with prior call or e-mail by customer. Shipping: USPS, to be billed to customer. Libreria: Peter Keisogloff Rare Books, Inc.